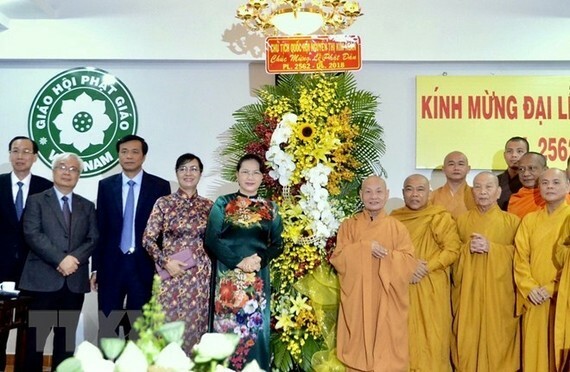 National Assembly (NA) Chairwoman Nguyen Thi Kim Ngan, on behalf of the Party and State leaders, visited and extended congratulations to some Buddhist establishments in Ho Chi Minh City on May 27 ahead of Lord Buddha’s 2562nd birthday. Visiting Chairman of the VBS’s Executive Council Most Venerable Thich Thien Nhon and Buddhist monks, nuns and followers at Office II of the Vietnam Buddhist Sangha (VBS), she hailed the enormous contributions by Vietnamese Buddhists to national development throughout history. The VBS has done a number of activities benefiting the religion and life while encouraging Buddhists nationwide to have good faith, adhere to the State’s law, fulfill citizens’ obligations, actively take part in charitable work, and contribute to poverty reduction. She affirmed that the Party and State always respect and ensure people’s right to freedom of belief and religion, care for the socio-economic development of religious communities, and create favourable conditions for followers and dignitaries of different religious, including Buddhism, to practice their religions authentically and fulfill the obligations of a citizen. Appreciating the Party and State leaders’ attention, Most Venerable Thich Thien Nhon said the VBS has been complying with Lord Buddha’s teachings to become a religion with humane values that is attached to humankind and generates good values for the life. Over nearly two millennia, the Vietnamese Buddhism has continually been standing by the country and become an integral part of the nation’s history, he noted. He pledged that the VBS will continue encouraging Buddhists to follow the State’s Constitution and law as well as the VBS’s policies and regulations, thus helping to develop the Vietnamese Buddhism sustainably and contributing to national development. Also on May 27, NA Chairwoman Ngan visited the Executive Council of the Giao hoi Tinh do cu sy Phat hoi Viet Nam (Vietnam Pure Land Buddhist Association) Central Committee. Talking to head of the association Nguyen Phuong Hieu, dignitaries, followers and members of the organisation, she spoke highly of their religious practices along with provision of free medical examinations and medicine and care for disadvantaged people, which have helped to build a more altruistic society. She applauded their efforts to join people nationwide to create great strides for Vietnam and improve the country’s stature in the international arena. 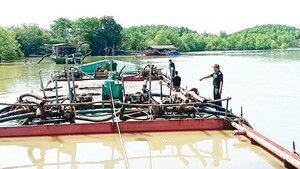 She asked the Vietnam Pure Land Buddhist Association to continue charitable work to help with national development. Nguyen Phuong Hieu said all dignitaries, followers and members of the association always trust the State’s guidelines and policies on religions and beliefs. They have focused on their religious practices and strived to carry out charitable activities and develop the association. The Executive Council will continue promoting their followers’ adherence to law and the organisation’s rules, along with charitable work, thereby helping to bring peace and happiness to all people, he added.